1st lunar month of 1770: first stage appearance at the Nakamuraza; he receives the name of Ichikawa Sumizô I and plays in the new year sogamono "Kagamigaike Omokage Soga". 11th lunar month of 1772: Ichikawa Komazô II and Ichikawa Sumizô I respectively take the names of Matsumoto Kôshirô IV and Ichikawa Komazô III at the Nakamuraza, playing in the kaomise drama "Ôyoroi Ebidô Shinozuka". 7th lunar month of 1778: premiere at the Nakamuraza of the play "Date Kurabe Okuni Kabuki"; Komazô plays the role of Fuwa no Bansaku [casting]. 7th lunar month of 1788: Komazô plays at the Kiriza the roles of Umeômaru [illustration] and Takebe Genzô in the drama "Sugawara Denju Tenarai Kagami". 11th lunar month of 1788: Komazô plays at the Nakamuraza the role of Ranmaru in Sakurada Jisuke I's kaomise drama "Tôzumô Hana no Edokata", which celebrates the return in Edo of the actor Nakamura Nakazô I. 1st lunar month of 1789: Komazô plays in the same theater the role of Karigane Bunshichi in the drama "Otokodate Itsutsu Karigane", sharing the stage with Nakamura Nakazô I (Kaminari Shôkurô), Ichikawa Monnosuke II (Gokuin Sen'emon), Ôtani Hiroji III (Hotei Ichiemon) and Matsumoto Kôshirô IV (An no Heibei). The performance is successful but the audience drops when Nakamura Nakazô I falls ill and has to be replaced. 11th lunar month of 1789: Komazô plays at the Nakamuraza in the kaomise drama "Komachi-mura Shibai no Shôgatsu". 1st lunar month of 1790: Komazô plays in the same theater the roles of Soga Jûrô Sukenari and Danzaburô in the new year drama "Haru no Nishiki Datezome Soga"; the role of Soga Gorô Tokimune is played by Ichikawa Omezô I. 2nd lunar month of 1791: Komazô, Matsumoto Kôshirô IV, Matsumoto Yonesaburô I and Matsumoto Kojirô join the Kawarasakiza; Komazô plays the roles of Soga Gorô Tokimune and Danzaburô in the new year drama "Hatsu Midori Saiwai Soga"; the role of Soga Jûrô Sukenari is played by Bandô Mitsugorô II. 5th lunar month of 1791: Komazô plays in the same theater the roles of Issun Tokubê, Hidari no Jingorô and Hanaregoma Chôkichi in Sakurada Jisuke I's drama "Onna Date Kôraiya Shima", which mixes several sekai like "Natsu Matsuri Naniwa Kagami" or "Futatsu Chôchô Kuruwa Nikki" worlds. Komazô's stage partner in the roles of Nuregami Chôgorô and Danshichi Kurobê is Nakamura Sukegorô II. 11th lunar month of 1791: Komazô moves to the Nakamuraza and plays 3 roles, including Shirai Gonpachi, in the kaomise drama "Nidai Genji Oshi no Gôkyû"; the role of Banzui Chôbê is played by Matsumoto Kôshirô IV. 1st lunar month of 1792: Komazô plays in the same theater 2 roles in the new year drama "Sumidagawa Shibai no Ennichi". 2nd lunar month of 1792: Komazô plays in the same theater the role of Issun Tokubê in the drama "Sakuradai Chotto Tsuribune"; the roles of Danshichi Kurobê and Tsuribune Sabu are played by Nakamura Sukegorô II and Matsumoto Kôshirô IV. This is the last program in 1792 for the debt-ridden Nakamuraza. 11th lunar month of 1792: Komazô moves to the Ichimuraza and plays in the kaomise program "Koganegiku Date no Ôkido", which celebrates the shûmei of Segawa Yûjirô II. 5th lunar month of 1793: Komazô plays in the same theater the roles of Momonoi Wakasanosuke, Jûnai and Teraoka Heiemon in the drama "Kanadehon Chûshingura". 11th lunar month of 1793: Komazô plays at the Kiriza the roles of Yorikane, Akamatsu Hikojirô and Fuwa Bansaku in the kaomise drama "Matsu no Tayû Yuki no Datezome", whose plot and characters belong to the "Meiboku Sendai Hagi" world. 1st lunar month of 1794: Komazô plays in the same theater the role of Soga Jûrô Sukenari in the new year drama "Butai no Hana Wakayagi Soga". 8th lunar month of 1794: Komazô plays in the same theater the role of Shunkan in the drama "Hime Komatsu Ne-no-Hi no Asobi". 11th lunar month of 1794: Komazô moves to the Kawarasakiza. His yearly salary drops from 700 ryô to 550 ryô (this is a general salary cut for all Edo actors). He plays five roles, including Shinozuka Gorô, the superhero of the "Shibaraku" scene, in the kaomise drama "Matsu no Misao Onna Kusunoki". 1st lunar month of 1795: Komazô plays in the same theater the roles of Soga Jûrô Sukenari and Danzaburô in the new year drama "Shimekazari Kichirei Soga"; the role of Soga Gorô Tokimune is played by Bandô Minosuke I. 5th lunar month of 1795: Komazô plays in the same theater the roles of En'ya Hangan and Teraoka Heiemon in the drama "Kanadehon Chûshingura", which commemorates the 12th anniversary (13th memorial service) of late Onoe Kikugorô I. 9th lunar month of 1795: Komazô plays in the same theater the role of Motome in the drama "Imoseyama Onna Teikin". 11th lunar month of 1795: Komazô plays at the Kawarasakiza in the kaomise program "Fuku Botan Azuma Dairi". 3rd lunar month of 1796: Komazô plays in the same theater the roles of Jûtarô and Kanpei in the drama "Taiheiki Chûshin Kôshaku". 8th lunar month of 1796: Komazô plays in the same theater the roles of Ishikawa Goemon and Sasaki Ganryû in the drama "Keisei Suikoden". 11th lunar month of 1796: Komazô plays at the Kawarasakiza in the kaomise drama "Itsukushima Yuki no Kaomise". 1st lunar month of 1797: Komazô plays in the same theater the roles of Soga Gorô Tokimune, Benchô and Tokura Jûnai in the new year drama "Fuji Miru Sato Yawaragi Soga"; the role of Soga Jûrô Sukenari is played by Bandô Minosuke I. 3rd lunar month of 1797: Komazô plays in the same theater the role of Sukeroku in the drama "Sukeroku Kuruwa no Sakurabito". His stage partners are Matsumoto Kôshirô IV (the shirozake seller Shinbê), Nakayama Tomisaburô I (Agemaki) and Onoe Matsusuke I (Ikyû). 5th lunar month of 1797: Komazô plays in the same theater the roles of Yamazaki Yogorô, Hanaregoma Chôkichi and Furuteya Hachirobê in the drama "Sekitori Shôbu no Katabira", which is similar to "Futatsu Chôchô Kuruwa Nikki". The role of Chôkichi's rival Nuregami Chôgorô is played by Onoe Matsusuke I. 9th lunar month of 1797: Komazô plays in the same theater the roles of Watanabe Sakyô and Shiga Daishichi in the drama "Mitsugimono Shiga no Irifune". 11th lunar month of 1797: Komazô and his father Matsumoto Kôshirô IV move to the Nakamuraza and play in the kaomise drama "Kaikei Kokyô no Nishikigi", sharing the stage with Ichikawa Danjûrô VI, Iwai Hanshirô IV, Onoe Matsusuke I, Nakayama Tomisaburô I, Bandô Hikosaburô III, Nakamura Noshio II, Bandô Minosuke I, Iwai Kumesaburô I and Ichikawa Ebizô V. This kaomise program, which celebrates the reopening of the Nakamuraza, is a huge success. 3rd lunar month of 1798: Komazô plays in the same theater the role of Kudô Saemon Suketsune in the drama "Wakakoma Norizome Soga". 5th lunar month of 1798: Komazô plays in the same theater the role of Washizuka Yaheiji in the drama "Katakiuchi Somewake Tazuna". 8th lunar month of 1798: Komazô plays in the same theater the roles of the spirit of Masakado and Chihara Sakon in the drama "Irifune Shinoda no Dekiaki". 9th lunar month of 1798: Komazô plays in the same theater the roles of Jûtarô and Yakanpei in the dramas "Taiheiki Chûshin Kôshaku" and "Ashiya Dôman Ôuchi Kagami". 11th lunar month of 1798: Komazô becomes jitsuaku and plays at the Nakamuraza in Fukumori Kyûsuke I's kaomise drama "Hana to Mimasu Yoshino no Miyuki". 3rd lunar month of 1799: Komazô plays in the same theater the role of Ikyû in the drama "Sukeroku Kuruwa no Hanami Doki", which commemorates the 22nd anniversary (23rd memorial service) of late Ichikawa Ebizô III. The roles of Sukeroku and Agemaki are played by Ichikawa Danjûrô VI and Iwai Kumesaburô I. 4th lunar month of 1799: Komazô plays in the same theater the roles of Kô no Moronô and Yuranosuke in the drama "Kanadehon Chûshingura". Ichikawa Danjûrô VI, who plays the roles of Teraoka Heiemon, Ôwashi Bungo and Momonoi Wakasanosuke, falls ill the 18th April and dies the 13th day of the 5th lunar month. The management of the Nakamuraza decides to stop the productions up to the 11th lunar month kaomise. 11th lunar month of 1799: Komazô plays at the Nakamuraza in the kaomise drama "Tametomo Yumiya no Oyafune", which celebrates the shûmei of Bandô Mitsugorô III. 1st lunar month of 1800: Komazô plays in the same theater the role of Izu no Jirô in the new year drama "Fuji o Mimasu Saiwai Soga". This production is the last stage appearance of Iwai Hanshirô IV, a long time stage partner of Komazô's father Matsumoto Kôshirô IV. 5th lunar month of 1800: Komazô plays in the same theater the role of Igami no Gonta ("Sushiya") in the drama "Yoshitsune Senbon Zakura". 5th lunar month of 1801: Komazô plays at the Ichimuraza the role of Matsunaga Daizen in the drama "Gion Sairei Shinkôki"; the roles of Princess Yuki and Konoshita Tôkichi are played by Segawa Kikunojô III and Ichikawa Yaozô III. 1st lunar month of 1802: Kôshirô's rank in the Edo hyôbanki, tachiyaku section, is jô-jô-kichi (superior - superior - excellent). 8th lunar month of 1803: premiere at the Nakamuraza of Sakurada Jisuke I's drama "Banzui Chôbê Shôjin Manaita", which commemorates the 1st anniversary of the death of Matsumoto Kôshirô IV; Kôshirô plays the role of Banzui Chôbê [casting]. 3rd lunar month of 1808: Kôshirô plays at the Ichimuraza the roles of Nikki Danjô, Yoemon and Tanizô in the drama "Date Kurabe Okuni Kabuki". 5th lunar month of 1808: Kôshirô plays in the same theater the roles of Kô no Moronô, Teraoka Heiemon and Amakawaya Gihei in the drama "Kanadehon Chûshingura". 7th lunar month of 1808: premiere at the Ichimuraza of Katsu Hyôzô I's drama "Toki-mo Kikyô Shusse no Ukejô"; Kôshirô plays the role of Takechi Mitsuhide [casting]. 8th lunar month of 1808: Kôshirô plays in the same theater two roles in the drama "Kore-ga-Katami Kôraiyajima", which commemorates the 6th anniversary (7th memorial service) of the passing away of Matsumoto Kôshirô IV. 1st lunar month of 1810: premiere at the Ichimuraza of Tsuruya Nanboku IV and Sakurada Jisuke II drama "Kokoro no Nazo Toketa Iroito"; Kôshirô plays the role of Hantoki Kurobê [casting]. 3rd lunar month of 1810: premiere at the Ichimuraza of Katsu Hyôzô I's drama "Kachi Zumô Ukina no Hanabure" (commonly called "Shirafuji Genta"); Kôshirô plays the roles of Gonsuke and the rice dealer Sakama Denbê [casting]. The play ends with a Tomimoto-based dance called "Kaze Sasou Kane mo Yotsudake", starring Kôshirô, Iwai Hanshirô V and Bandô Mitsugorô III. Kôshirô also plays the role of Ishikawa Goemon in the drama "Sanmon Gosan no Kiri"; the role of Mashiba Hisayoshi is played by Suketakaya Takasuke II. 5th lunar month of 1810: premiere at the Ichimuraza of Katsu Hyôzô I and Sakurada Jisuke II drama "Ehon Gappô-ga-Tsuji"; Kôshirô plays the roles of Tateba no Taheiji and Saeda Daigakunosuke [casting]. 1st lunar month of 1811: Kôshirô plays at the Ichimuraza the roles of Kudô Saemon Suketsune, Kyô no Jirô, the rônin Hataemon and Taira no Kagekiyo in the new year sogamono "Mutsumashizuki Hôrai Soga". 2nd lunar month of 1811: Kôshirô plays in the same theater the role of Ikyû in the drama "Sukeroku Yukari no Edo Zakura"; the roles of Sukeroku and the courtesan Agemaki are played by Ichikawa Danjûrô VII and Iwai Hanshirô V.
7th lunar month of 1811: premiere at the Ichimuraza of "Tamamo-no-Mae Obana no Nishiki", the Kabuki adaptation of the puppet theater drama "Tamamo-no-Mae Asahi no Tamoto"; Kôshirô plays the roles of In-no-Chûô, Kyûbi no Kitsune (the nine-tailed fox) and Miuranosuke Yoshiaki [more details]. It was followed by the premiere at the Ichimuraza of the drama "Nazo no Obi Chotto Tokubê"; Kôshirô plays the role of Ôshima Danshichi [more details]. 9th lunar month of 1811: Kôshirô plays at the Ichimuraza the roles of Kawagoe Shigeyori and Igami no Gonta in the classic "Yoshitsune Senbon Zakura". 3rd lunar month of 1813: premiere at the Moritaza of Tsuruya Nanboku IV's play "Osome Hisamatsu Ukina no Yomiuri" (commonly called "Osome no Nanayaku", in English "The seven roles of Osome"). The seven roles are played by Iwai Hanshirô V; Kôshirô plays the roles of Kimon no Kihê and Matsumotoya Sashirô [casting]. 3rd lunar month of 1814: premiere at the Ichimuraza of Tsuruya Nanboku IV's drama "Sumidagawa Hana no Goshozome", commonly called "Onna Seigen"; Kôshirô plays the roles of Kume no Heinai Nagamori, Yamada no Saburô Kanetsugu and Sarushima Sôta (in reality Awazu no Shichirô) [more details]. 5th lunar month of 1815: premiere at the Kawarasakiza of Tsuruya Nanboku IV's drama "Kakitsubata Iro mo Edozome" (commonly called "Oroku to Gantetsu" or "Dote no Oroku"); Kôshirô plays the roles of Funabashi Jirôzaemon and Gantetsu [casting]. 1st lunar month of 1816: premiere at the Nakamuraza of the new year sogamono "Hiyoku no Chô Haru no Soga Giku". This new year drama mixed two sekai: it was a sogamono and a gonpachi-komurasakimono. The sogamono fell into oblivion and the gonpachi-komurasakimono was staged independently under the title "Sono Kouta Yume mo Yoshiwara" ("Gonge" and "Gonjô"); Kôshirô plays the roles of Ômi no Kotôta, Banzuiin Chôbê, the priest Kanshinbô and the carpenter Rokusa [more details]. 3rd lunar month of 1818: Kôshirô plays at the Nakamuraza the role of Banzuiin Chôbê in the drama "Banzui Chôbê Shôjin Manaita". His partners in the roles of Shirai Gonpachi and Komurasaki are Iwai Hanshirô V and Segawa Kikunojô V.
9th lunar month of 1820: Kôshirô and Iwai Hanshirô V go together to Kamigata. Kôshirô plays in Ôsaka at the Naka no Shibai the role of Mitsuhide in the drama "Iwai Kotobuki Chiyo no Matsumoto" (an auspicious title to welcome the 2 Edo stars). He also plays three roles in "Aburaya Osome Ukina no Yomiuri". 3rd lunar month of 1821: Kôshirô plays at the Naka no Shibai the roles of Tôbê, Iwafuji and Sôta in Tsuruya Nanboku IV's drama "Sumidagawa Hana no Goshozome". 6th lunar month of 1821: Katsu Hyôzô I's drama "Kachi Zumô Ukina no Hanabure", commonly called "Shirafuji Genta", is revived for the first time, 11 years and 3 months after its premiere in Edo, in Kyôto at the Kitagawa no Shibai; Kôshirô plays the roles of Denbê and Gonsuke [casting]. He also plays the role of Senoo Jûrô Kaneuji in the drama "Genpei Nunobiki no Taki"; the role of Saitô Bettô Sanemori is played by Bandô Mitsugorô III. 7th lunar month of 1821: Kôshirô plays at the Naka no Shibai the role of Miki Danjô in the drama "Hagi ha Sendai Na ha Matsumoto", whose plot and characters belong to the "Meiboku Sendai Hagi" world; the role of Hosokawa Katsumoto is played by Nakamura Utaemon III. 9th lunar month of 1821: Kôshirô plays in the same theater the roles of Ishikawa Goemon, Tôkichi and Kambei in the drama "Konoshita Kage Hazama Gassen". He also plays the role of Banzui Chôbê in the drama "Tatehiki Kotoba no Hanakawado"; the roles of Shirai Gonpachi and Komurasaki are played by Iwai Hanshirô V and Arashi Koroku IV. Fall 1821: Kôshirô goes back to Edo. 11th lunar month of 1821 (end of the month): premiere at the Kawarasakiza of Tsuruya Nanboku IV's drama "Imoseyama Hitome Senbon", which mixes the "Yoshitsune Senbon Zakura" and "Imoseyama Onna Teikin" worlds; Kôshirô plays the roles of Taira no Tomomori, Kenmotsu Tarô and Kawagoe Shigeyori [casting]. 5th lunar month of 1822: Kôshirô plays at the Ichimuraza the roles of Kawagoe Shigeyori, Tokaiya Ginpei, Taira no Tomomori and Igami no Gonta in the drama "Yoshitsune Senbon Zakura". 5th lunar month of 1823: Kôshirô plays at the Nakamuraza the roles of Matsuômaru and Haji no Hyôei in the drama "Sugawara Denju Tenarai Kagami". 9th lunar month of 1824: Kôshirô plays at the Nakamuraza the role of Kyôgoku no Takumi in the drama "Hikosan Gongen Chikai no Sukedachi". 6th lunar month of 1825: Kôshirô plays at the Kawarasakiza the role of Senoo Jûrô Kaneuji in the drama "Genpei Nunobiki no Taki". He also plays the role of Sasano Sangobê in Namiki Gohei I's drama "Godairiki Koi no Fûjime"; the roles of Sakuraya Koman and Satsuma Gengobê are played by Iwai Shijaku I and Ichikawa Danjûrô VII. 7th lunar month of 1825: Kôshirô plays at the Nakamuraza the roles of Kô no Moronô, Sadakurô, Kakogawa Honzô and Hara Goemon in the drama "Kanadehon Chûshingura". 7th lunar month of 1825: premiere at the Nakamuraza of Tsuruya Nanboku IV's ghost play "Tôkaidô Yotsuya Kaidan"; Kôshirô plays the role of Naosuke Gonbê [casting]. 9th lunar month of 1825: premiere at the Nakamuraza of Tsuruya Nanboku IV's drama "Kamikakete Sango Taisetsu"; Kôshirô plays the roles of Satsuma Gengobê (in reality Fuwa Kazuemon) and Yasuke [casting]. 9th lunar month of 1827: Kôshirô plays at the Nakamuraza the roles of Naosuke Gonbê and Tamiya Iemon in the drama "Tôkaidô Yotsuya Kaidan". 1st lunar month of 1828: revival at the Nakamuraza of the dance-drama "Oshidori" by Segawa Jokô II; Shikan plays the role of Matano Gorô Kagehisa [more details]. 11th lunar month of 1828: Kôshirô plays at the Nakamuraza 5 roles, including Akushichibyôe Kagekiyo, in Tsuruya Nanboku IV's drama "Motomishi Hana Otogi Heike"; his yearly salary is 600 ryô. 3rd lunar month of 1829: Kôshirô plays at the Nakamuraza the roles of Kawagoe Shigeyori, Igami no Gonta and the priest Yokawa no Zenji Kakuhan in the drama "Yoshitsune Senbon Zakura". 21st day of the 3rd lunar month of 1829: a fire breaks out from the shop of Owariya Tokuemon, in the district of Kanda Sakuma-chô. It spreads and destroys the Edo theaters district. Kôshirô decides to go to Kamigata through Ise. Summer 1829: tour in Ise. 11th lunar month of 1829: Kôshirô plays at the Kitagawa no Shibai in the kaomise drama "Matsushita Kaheiji Renga Hyôban"; his stage partners are Nakamura Utaemon III, Kataoka Nizaemon VII, Ichikawa Hakuen II, Arashi Rikan II, Nakamura Matsue III, Iwai Kumesaburô II and Sawamura Kunitarô II. Kôshirô also plays the role of Banzui Chôbê in the drama "Edo Shiire Ikiji no Yasuuri"; the roles of Chôbê's wife and Shirai Gonpachi are played by Iwai Kumesaburô II. 3rd lunar month of 1830: Kôshirô plays at the Kado no Shibai the roles of Kô no Moronô and Hara Goemon in the drama "Kanadehon Chûshingura". Spring ~ Summer 1830: tour in Ise, Nagoya and Tateyama with Ichikawa Hakuen II. Then, the two actors go back to Edo through the Nakasendô. 8th lunar month of 1830: Kôshirô is back in Edo and plays at the Kawarasakiza in the drama "Ichikawaya Masago no Gohiiki". 6th lunar month of 1834: Kôshirô plays at the Nakamuraza the role of Naosuke Gonbê in the drama "Tôkaidô Yotsuya Kaidan". 3rd lunar month of 1836: Kôshirô plays at the Nakamuraza the roles of Momonoi Wakasanosuke and Hara Goemon in the drama "Kanadehon Chûshingura". 3rd lunar month of 1836: Kôshirô plays at the Nakamuraza the roles of Gonta and Kajiwara Heizô Kagetoki in the "Ko-no-Mi" and "Sushiya" scenes of the drama "Yoshitsune Senbon Zakura". 8th lunar month of 1837: Kôshirô plays at the Nakamuraza the roles of Kô no Moronô and Hara Goemon in the drama "Kanadehon Chûshingura". 4th ~ 5th lunar months of 1838: Kôshirô appears on stage for the last time, at the Nakamuraza, playing in the drama "Bunbu Ryôdô Ôgi no Adauchi". He suddenly collapses on stage and dies the 10th May. 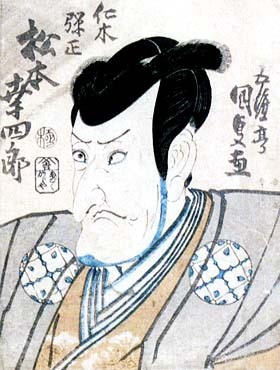 Matsumoto Kôshirô V was one of the Kabuki giants, a senryô yakusha, during the Bunka, Bunsei and Tenpô eras. In his 20's he was a tachiyaku actor excelling in nimaime roles like Soga Jûrô Sukenari in sogamono dramas. He started to perform jitsuaku roles from the 11th lunar month of 1798 and quickly became one of the best actors for villain roles, especially in Tsuruya Nanboku IV's kizewamono. He had a considerable influence on actors like Onoe Kikugorô III or Ichikawa Danjûrô VII. The kata he deviced for some of the most famous roles in Kabuki history, like Gonta ("Sushiya") or Nikki Danjô* ("Meiboku Sendai Hagi") are still used nowadays. Matsumoto Kôshirô V's best roles: Nikki Danjô ("Meiboku Sendai Hagi"), Kô no Moronô ("Kanadehon Chûshingura"), Igami no Gonta ("Yoshitsune Senbon Zakura"), Tateba no Taheiji/Saeda Daigakunosuke ("Ehon Gappô-ga-Tsuji"), Matsuômaru ("Sugawara Denju Tenarai Kagami"), Iwafuji ("Kagamiyama Kokyô no Nishikie"), Ikyû ("Sukeroku"), Akechi Mitsuhide ("Badarai no Mitsuhide"), Kudô Saemon Suketsune (sogamono) and Banzui Chôbê. (*) the mon on Danjô's costums is always Matsumoto Kôshirô V's one.